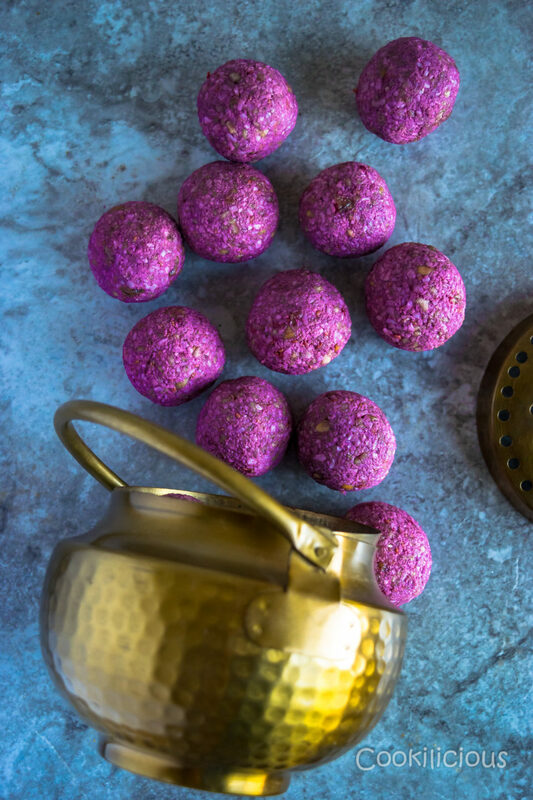 Vegan No Bake Raspberry Energy Bites are made with raw cashews, coconut and raspberries. They’re brightly flavored and a delicious pick-me-up, healthy snack recipe. They are No Cook, Gluten Free and Vegan Friendly. A tasty and nutritious snack that adults and kids will love equally. Here is an easy recipe of a perfectly sweet and seriously satisfying vegan snack that will be made on a repeat mode once you start having them! That is what has happened to me. Ever since I came across this recipe in a magazine, I have been dying to try it. Finally I got a chance today. Thankfully I had all the ingredients handy in my pantry and my freezer. So it was like a sign from above! There is a little story on how I stumbled upon this recipe. I enjoy our weekly grocery trips as that is when I normally pick up a unique never-tried-before ingredient for the week. But after having leisurely browsed through all the aisles waiting at the checkout line can get a tad boring. That is when I grab one of those tempting looking cook books at the checkout counter. While I browse through it for an inspiration, KR patiently waits for our turn and then checks out. If I see something that I like, I make a mental note of the same for me to try it later. 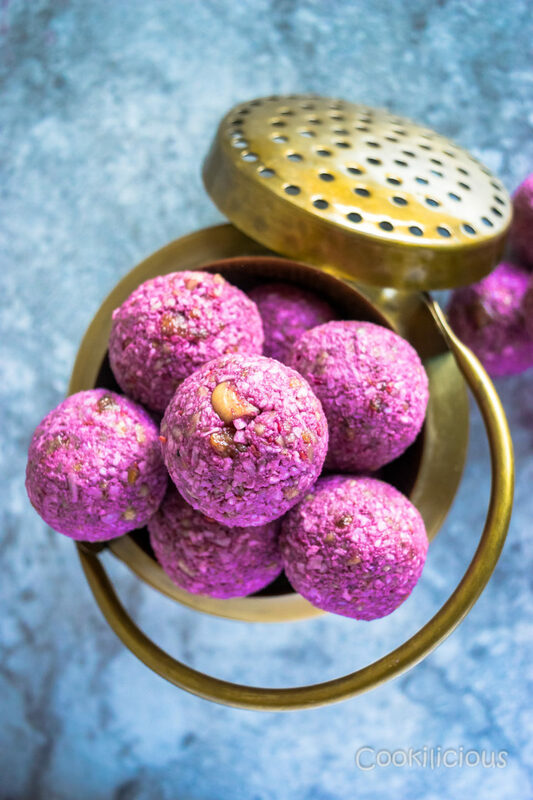 That is how I came across this delicious energy bites recipe. I however tweaked it a bit to suit my taste. It was an oats based recipe and I chose to not use it. 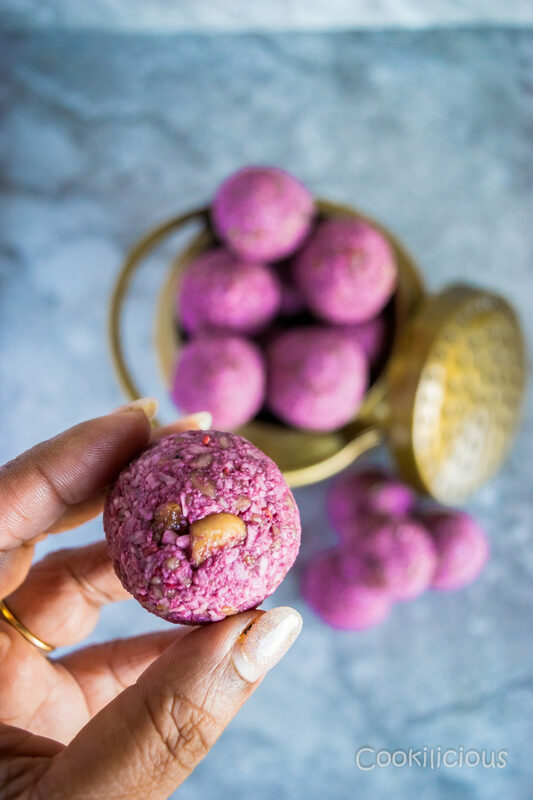 I have always read about these pick-me-up kind of snacks that are great to munch between meals, pre/post workout or for those midnight cravings for something sweet, but never really got to make something for us. Like normally husbands do when grocery shopping, KR too got excess of frozen raspberries when all I asked for was 1 packet. 😉 Ever since then, I have been trying to make recipes with frozen raspberries in it. Last time I made No Churn Ferrero Rocher & Raspberry Ice Cream which was a big hit at the party. I add them to smoothies and milkshakes as well. Adding frozen raspberries to any recipe is a good idea as they are a great way to add lots of flavor along with nutrition to sweet snacks.
. Pulse till the mixture is broken down, well combined and sticking together. Transfer it to a plate and using your hands, shape the mixture into balls. At this point, you can leave it as is or roll it over some desiccated coconut. Place them in the fridge for 30 minutes to set. 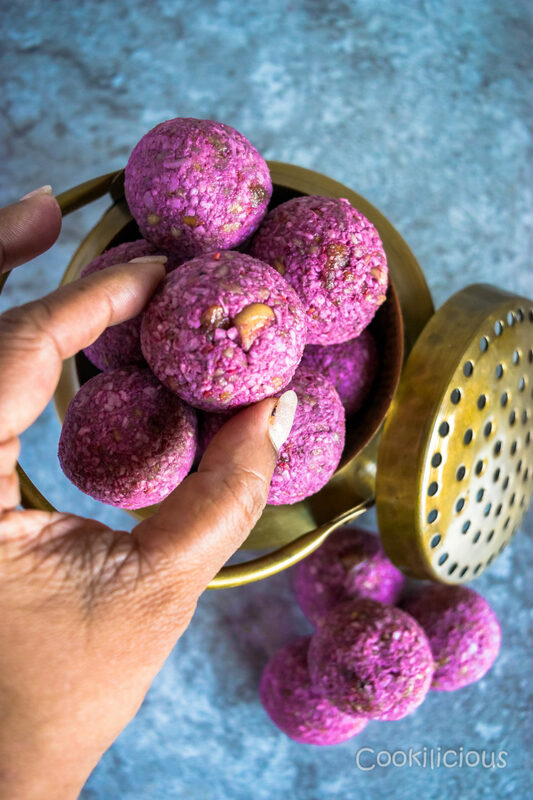 Once they are set, enjoy these Vegan No Bake Raspberry Energy Bites guilt free. I can give you numerous ways to enjoy this no-cook snack. Need energy before or after your workout, pop one and you are good, if craving for something sweet at night, this is an ideal choice, kids come home from school and ask for something to eat, give them one each till you cook something for them, your partner asks for something sweet post dinner, offer this, you have unexpected guests and need to cook something quickly, what better than Vegan No Bake Raspberry Energy Bites! You can even pop them in your blender while making your smoothie. Enjoy this light snack for breakfast or an evening snack. Its vegan friendly, gluten-free and of course super delicious. 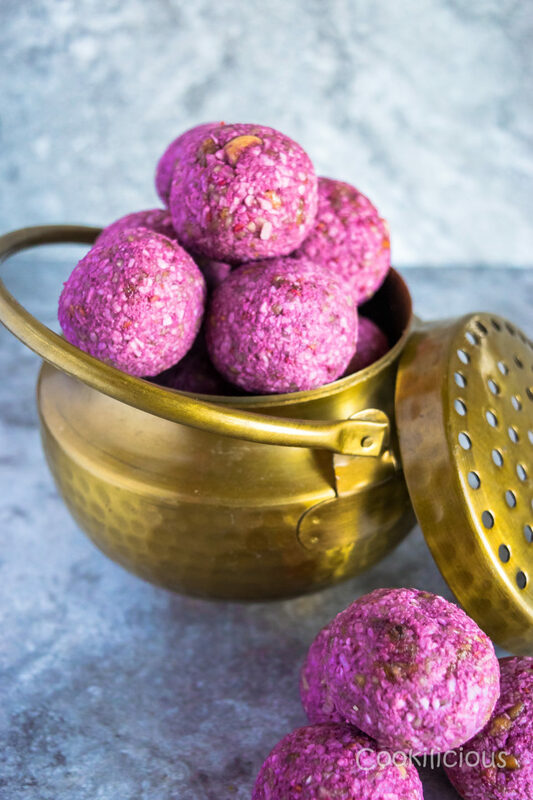 Vegan No Bake Raspberry Energy Bites are made with raw cashews, coconut and raspberries. They're brightly flavored and a delicious pick-me-up, healthy snack recipe. They are No Cook, Gluten Free and Vegan Friendly. A tasty and nutritious snack that adults and kids will love equally. In a food processor add desiccated coconut, cashews, dates, vanilla extract, salt and frozen raspberries. Pulse till the mixture is broken down, well combined and sticking together. Transfer it to a plate and using your hands, shape the mixture into balls. At this point, you can leave it as is or roll it over some desiccated coconut. Place them in the fridge for 30 minutes to set. 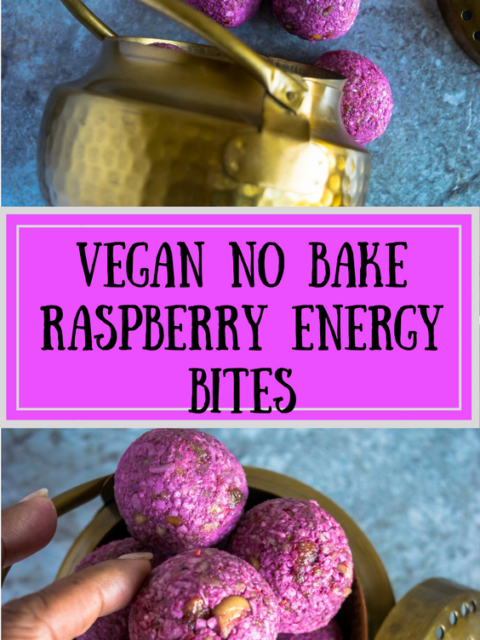 Once they are set, enjoy these Vegan No Bake Raspberry Energy Bites guilt free. You can use raw cashews in the recipe as well. Some other healthy snacks that you can make at home are Spicy Garlic Almonds, Chickpea & Edamame Crispies, Steamed Bajra Muthiya/Dumplings Snack, Kobichi Vadi | Steamed Cabbage Cakes, Chickpeas Sundal, No-Cook FroYo Muffins, Chickpea Flour Mini Quiche Muffins and Sweet Corn & Bulgur Wheat Mini Steamed Cakes| Idli. Wow! interesting post. I have tried other protein bites but have never tried this one. This looks so tempting that I can’t wait to prepare it for snacks. Keep sharing such snack ideas with readers.